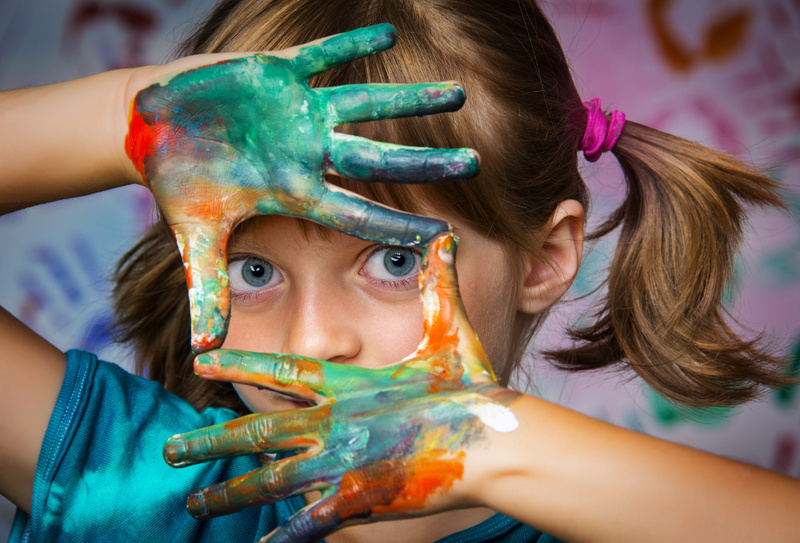 Is Colour Psychology Affecting Your Business? A recent study has found that the colours used in mobile apps can radically affect the way the app is used. Bright colours perform better in low GDP per capita countries, while minimal colours work best in higher GDP per capita. It’s been a long held open secret in design that colour matters, whether it’s a logo or a product flyer. 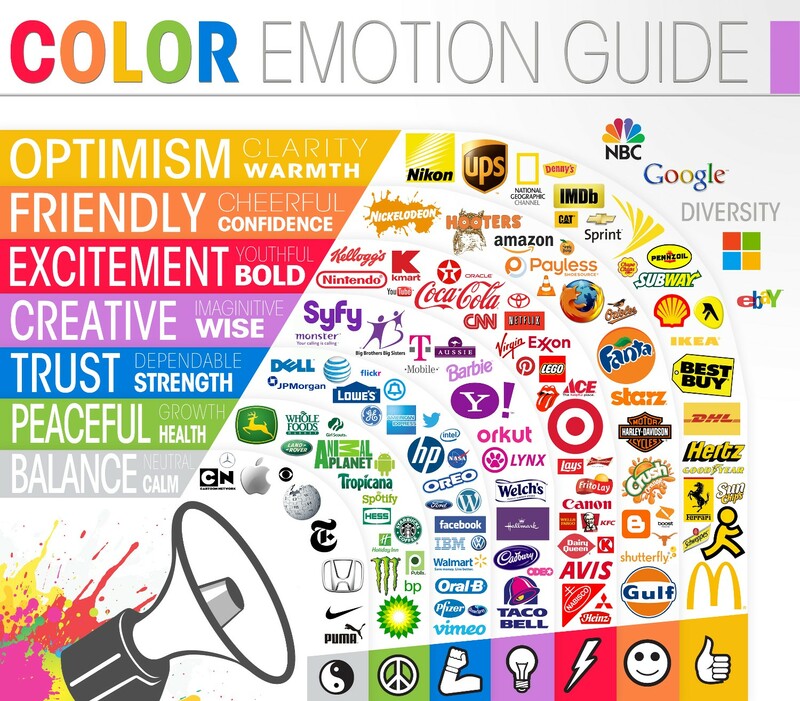 By looking at colour psychology, we can figure out more about how colour affects people and how to use it in business. What would you say if I told you that serving your meals on plates that contrast your food colour makes you eat less? How about the idea that blue street lights can lead to drops in crime rates? Or that silver cars are less likely to be involved in accidents? These are all real facts that show the importance of colour choice in day-to-day life. Colour is something that can’t be ignored. It influences your choices on a daily (and sometimes on an hourly) basis. To the point where particular shades can decide how positively you view a mobile app. Outside of art and design, colour is often overlooked. As a single business start-up, many pick their favourite colour for the branding and leave it at that. But there’s a reason why both Cadbury’s chocolate and Coca-Cola have had their signature colours copyrighted… and why they picked them in the first place. That reason is studied in colour psychology. Different colours – and their shades – can affect the way you behave. Want to know more? Sure you do. Here’s a comprehensive breakdown of the different colours and how they can control a person’s mind. Red is the colour of impulse and action. Red physically excites viewers and has been proven to produce a more effective painkiller than other colours. Red has also been linked to sexual attraction. During scientific testing, it was proven that both men and women find people of their sexual preference more attractive if they’re close to the colour red. Companies who want to be seen as daring or adventurous implement this colour into their branding to take advantage of red’s effects. As red lowers rational thinking, it’s also used in stores to encourage point-of-sale purchases. But in analytical or high risk situations it’s best to avoid red. Scientists have found that red leads to higher chances of mistakes during tests and competitions. It instils feelings of doubt and lowers confidence during challenges. This has been attributed to red’s use in results marking and warning signs. Subconsciously, many people associate it with failure and danger. The colour yellow is associated with optimism and energy. In marketing, branding, and symbolism, it’s ‘fun’ colour. Yellow reflects the largest amount of light and is the fastest recognised colour in human vision. Brands and signs that want to stand out make use of this aspect as much as possible. Unfortunately, because of the high amount of light it reflects, yellow can cause visual fatigue. Perhaps because of this intensity, yellow can create feelings of anxiety and anger when used in excess. A major concern for parents is the unsubstantiated claim that yellow rooms can cause babies to cry. Along with red and black, bright yellow is one of nature’s most common warning colours. This has stepped through into visual design; avoid pairing yellow and black unless you want to convey danger! Blue is the colour of tranquillity and trust. The most popular colour by a long shot, blue is a people pleaser. In colour psychology, blue is the opposite to red. It’s ability to cause feelings of calm can cause lowered blood pressure and more restful sleep. Blue is good for promoting subconscious feelings of loyalty and reliability. A 2003 study by the Journal of Business found that customers were 15% more likely to return to brands with blue branding over those with hotter colours. A huge percentage of companies that rely on consumers’ feelings of safety take advantage of this. Barclays and Deutsche Bank, major financial corporations, both chose blue logos. More recently, many social networking sites have also taken up blue as their primary colour. For some this might be incidental. Mark Zuckerberg’s reasoning for why Facebook is blue? Orange is seen as playful and fun. A bold colour, orange is a favourite of children’s and sports brands. Orange creates a sense of energy and enthusiasm. A Dulux colour survey found that orange’s popularity decreases with age, something that should be taken into mind during use. At its loudest shades, orange has become a safety signal used on power tools, gardening appliances, hi-vis jackets, and traffic cones. Its high visibility means it’s often used to call attention. Companies offering high-end or luxury goods should avoid orange – 26% of Western consumers view orange as a ‘cheap’. At the opposite end of the spectrum, lighter shades of orange are often used to invoke comfort and calm. Light orange portrays warmth without the brighter shades overpowering connections. When you wish to create a sense of relaxation and blue is too cold, pale orange is the best choice. Green is the colour of balance. Nature is still green’s biggest association and it’s liberally used by companies to remind consumers of their ‘eco-friendly’ statuses. Green’s use in this way has created a whole host of marketing terms. Green brands, green washing and green marketing are just a few. While red can create feelings of doubt and insecurity, green does the opposite. Green is a positive colour that has been linked by studies to increased creativity. Newer studies are also seeing a pattern between green and states of mental relaxation. There is some theorising that green’s overly positive attributes may come from its ease of access in human vision. Just as likely, however, are its traditional links to good luck, fortune and beginning. Purple is associated with luxury. For centuries purple was the world’s most expensive colour, as it could only be obtained from crushed snails from modern-day Lebanon. As a result, it was a colour used exclusively by the obscenely wealthy. (In ancient Rome, it was sometimes too expensive for even the Emperor to purchase.) With monarchs the most obvious of its wearers, it became inextricably linked with royalty. This connotation is especially strong within the UK and ex-British Empire countries, as laws in the Elizabethan era made it illegal for anyone but members of the royal family to wear purple. Purple’s psychological affects are somewhat ambiguous. Though deep in symbolic meaning, its emotional reactions are based more on which colour holds majority in its mix. Purples with more red become energetic and warm. Purples with more blue become solemn and cool. Shades of purple with equal parts red and blue inhabit an uncertain area where they embody both of their assets. Though pink has many different attributes, it is almost universally seen as feminine. Many children’s and toy brands use the colour pink (and its varying tones) as an instant visual signifier that their products are aimed at girls. This trend has carried into women’s products as well. With the advent of pink guns, pink fishing rods and pink pens, the colour pink has been labelled as ’emasculating’ to men. Paler shades of pink have calming psychological effects, in much the same way gentle orange shades do. Belief in pale pink’s ability to reduce heart rate and induce a state of relaxation has lead to it being used in American drunk-tanks to calm prisoners and to weaken rival sports teams. Like all bright colours, vibrant pink colours act as a stimulant. It has many psychological similarities to red, including raised heart rate and breathing. Like bright orange, too much of a hot pink can be overwhelming. It’s usually used for dramatic flair, rather than as a main colour. Brown is the colour of choice for dependability. Much like green, brown inherits most of its associations from nature. Brown is easily the least offensive of the colours. A warm colour but with a duller impact than the others, brown is a colour of reassurance and reliability. In advertising brown has developed an association with ruggedness. Through this connection it has become a masculine colour, used to create a sense of adventure. This ties back in to its natural connotations. You don’t hear the phrase ‘down to earth’ without picturing a shade of brown. In design brown is used as a neutral colour, alongside beige and tan. Brown’s ability to fade into the background allows other colours to catch attention over itself. Its negative associations with boredom and the mundane mean it’s better used sparingly if you want to create excitement. Black is the colour of seriousness and sophistication. Black has found itself as the go-to colour for high-end brands as it creates a sense of glamour. Used as a primary colour it dominates visually. When used with a colour that creates stark contrast, the effects are dramatic. Black is one of the few colours to come with a sense of physical presence. A study has shown that black objects are read as heavier than lightly coloured ones. Black’s ability to create a sense of space can be used positively or negatively. Its negative possibilities should be taken into consideration if used in decor. An oppressive colour, too much black in confined spaces can create a feeling of helplessness and claustrophobia. It can also create the impression of barriers and segregation. Do not over use black to the point that you are seen as valuing seriousness above other qualities. White is associated with cleanliness and professionalism. In psychological terms it has the opposite effect to black. Where black is oppressive, white is open. White is often used for baby products because of its traditional linking to innocence and purity. In medicine it’s used to convey cleanliness. Apple‘s recent use of white in its branding and products has lead to a new phenomenon where white has become associated with technology. In this area, it’s used to create the same impact as black. If not used carefully, too much of white can come across as alienating. White is fundamentally a cool colour and can create a psychological sense of coldness. Many interior designers will opt for off-whites over pure white to avoid its chilly edge. Often overlooked and seldom thought about, grey has become the colour of boredom and conformity. Grey can be either warm or cool, dependent on its red/blue content. Grey diminishes the impact of any colour put next to it, making it a great match for fluorescents. Cool grey colours carry more negative connotations than warm ones. Blue heavy greys are the colours used with industry to create a sense of uniformity. Many subliminally associate grey with the feelings they have in school or work. Colours can be split into two groups: warm or cool. The difference between a warm and a cool colour lies in its colour balance. ‘Warm’ colours have an undertone with more red while ‘cool’ colours have more blue. You can have a cool grey and a hot grey. Though they are both fundamentally grey, one will have more blue and the other more red. 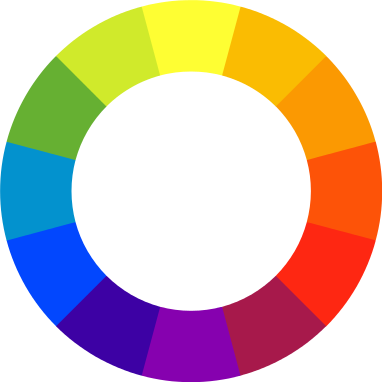 Starting from red and move round the colour wheel (above) counter-clockwise to the first green. These are warm colours. They have higher yellow or red content. From the second swatch of green to the purple, once again moving counter-clockwise, are the cool colours. These have higher blue content. Use of cool or warm colours can make huge differences in people’s feelings. I touched upon this when I mentioned the benefits of light orange over light blue. Studies have revealed that people report differences in temperature in the same environment depending on whether a warm or cool colour is most prominent. As touched upon in the intro of this post, bright colours and muted colours can create different impacts in different countries. For most, this is mainly a cultural aspect. For instance, countries like Kenya, India and Burma have a high preference for bright colours and you’ll find heavy use of colour ingrained in their history and religion. As a general ruling, at this point in time countries with low average earnings per person will have a stronger draw towards bright colours. Countries with higher average earnings per person will have a preference to more subtle colours. These countries include Denmark, the US and Singapore. There’s also some indication that men are more attracted to bright colours, while women like softer ones. However, this is minimal at best. There you have it! A comprehensive guide on colour psychology. Well, all that’s been reported, that is. Did you notice where colour has affected your habits? Spotted a way to use colour to help your brand? If you’ve had some thoughts on colour psychology or want to talk about the post, get in touch with us on Twitter, Facebook or Google+. For more information on how we can help your business, click through to www.adspruce.com.